Lorena "Hick" Hickok is assigned to cover Eleanor Roosevelt in the 1932 political campaign. This is the start of a love story that would last for years, despite long periods of separations and the fact that Eleanor Roosevelt was to become The First Lady of United States. But, this love story could not last. Madame, that Hick so lovingly called Eleanor could never become someone anonymous again, even after FDR death. 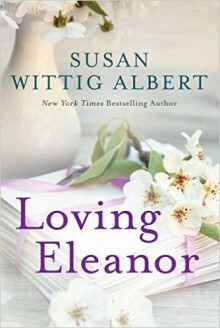 Loving Eleanor is a fictional memoir based on the relationship between Lorena Hickock and Eleanor Roosevelt. When I first saw this book was my reaction "is this about Eleanor Roosevelt?" And, strangely I was correct. I do have an interest in FDR and that could very well be why my first reaction was thinking this was about his wife. The book starts off with a funeral, Eleanor Roosevelt's and a grief-stricken Hick isn't there, despite being invited. She can't handle it and don't want them all to see how Eleanor's death has broken her. And, now she wonders what to do with all the letters that she has after Eleanor. There are vultures out there that would do anything to get their hands on them. In the end, she decides to have the letters sealed and not open until 10 years after her death. In this book, she decides also to write their story and having it sealed as well. Susan Wittig Albert has written a poignant tale of a doomed love story. A talented journalist that falls in love with the wife of the future president. At first, their love burns hot, but as the years go by their love grows perhaps not colder, but the hot passion is not there anymore. But, they still love each other dearly. But Eleanor's would become a personage, an icon. The First Lady of the World. She was no longer a privet person from the day FDR become president. They would both fall in love with other people, but they would until Eleanor died always be in touch. And for Hick would Eleanor always be the one. I especially liked the fact that, despite that the book's story takes place during several years when much happened in America; the Great Depression, and WW2, did the book never feel too heavy to read and it never felt too bogged down with too much history. It was well-written and well-researched. The story flowed easily on and it was hard to put the book down. Hick never wrote a memoir about their life, but this book has through extended research given us a fictional version of their life together. For more information read: The story behind the book and the extensive research that went into the project. I want to thank the publisher for providing me through NetGalley with a free copy for an honest review. Awesome review. I'm trying to read this one and it hasn't completely grabbed my full attention yet. I'm hoping it does!